On February 11 of this year, between the hours of 6:00 p.m. and 8:00 p.m., my laptop was stolen from the JavaU inside Concordia’s Hall building. After making frantic inquiries to both the police and Concordia security, I discovered that, partly due to the fact there were no cameras on location to record the theft, my chances of recovering it were slim to none. There were no cameras, I was told, because the owners of JavaU have refused Concordia’s Security Department’s requests to install them. Several times. I can’t speak to their specific reasoning, be it personal or political, but it was immediately evident to me that not only would my chances of getting my property back have been much higher had there been a security camera, but also that the downsides JavaU supposedly feared would have been entirely non-existent. Like the seemingly inevitable outcome of human enslavement resulting from advances in artificial intelligence, people harbour a deep distrust of security cameras, as if their very existence brings us one step closer to a dystopian nightmare. But as long as they remain in the public and not private sphere, what’s the harm? Far from curtailing our democratic freedoms, security cameras are a vital tool for ensuring democracy. Television monitors in the Hall building, then the $4,000 in damages that will have to be paid by Concordia students could have been charged to the vandals themselves. What’s more, security camera footage would have put to rest idle speculation about the identity of the culprits, and put an end to the fog of mistrust during an election period already rampant with accusations of misconduct. Security cameras would have also come in handy during these elections had they been able to capture the culprits who, on March 27th, in a supposed smear campaign against the Action slate, papered the Hall building with posters decrying the slate as a bunch of “corporate whores,” casting suspicions—appropriately or not—on the opposing Your Concordia slate. The truth is that even with all the cameras Concordia currently has on campus, there aren’t enough eyes to review all of the footage as it happens, and so that footage is reviewed only with good cause or reason, and none of it is kept indefinitely. Security cameras, like all tools used in law enforcement, aren’t without their flaws. With 4,200,000 security cameras currently in use in the United Kingdom—forming the largest network of closed-circuit cameras in the world—serious questions have been raised about their effectiveness in solving crimes, which is a valid concern. But the downsides, if any, are limited to the cost of installation and upkeep, not the curtailing of our freedoms. After my laptop was stolen, I left my information with the JavaU barista as she closed shop. The next day I arrived bright and early for more news, only to get let down again. Before I left, I noticed that the piece of paper on which I had provided all of my contact information had already been updated with the information of another person whose property had been stolen. 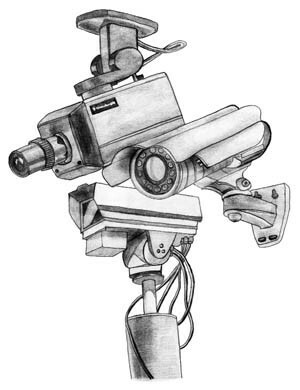 How long will it take for security cameras to be seen as an asset, and not as an enemy? This article originally appeared in The Link Volume 31, Issue 29, published April 5, 2011.